With Steve Curtis and James Sheppard in the cockpit, the Miss GEICO team claimed two world title this year. Photo by Pete Boden/Shoot 2 Thrill Pix. In the past two weekends, British-born throttleman Steve Curtis has claimed two world titles—Super Boat International and Offshore Powerboat Association—with driver James Sheppard in the newest Miss GEICO raceboat, a 47-foot Victory-built catamaran he happens to own. 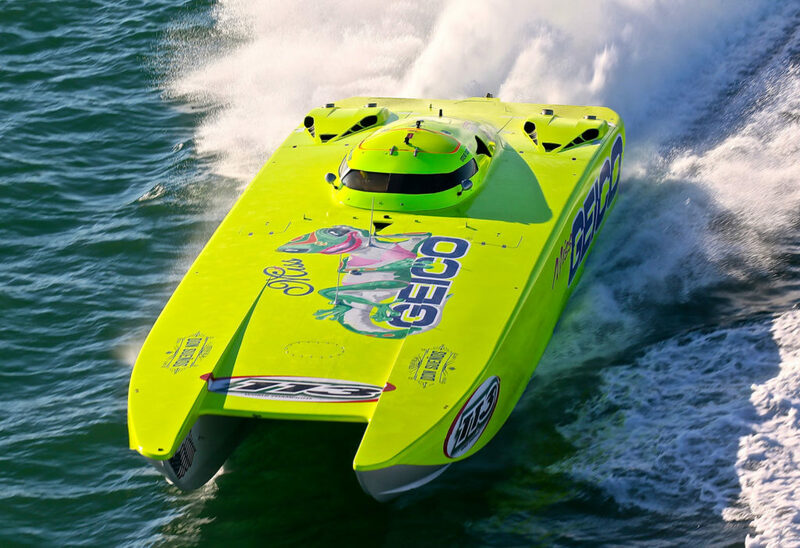 Curtis leased the boat, as well as his throttling expertise, to the Miss GEICO crew to finish out the season after the team’s 44-foot Victory cat was significantly damaged in a tragic accident during this summer’s OPA St. Clair River Classic race in Michigan. The accident claimed the life of offshore racer Keith Holmes, and longtime Miss GEICO throttleman Scott Begovich and Marc Granet stepped out of the cockpit for the rest of the season. In a way, working with the Miss GEICO group has been a homecoming for Curtis. He counts the five owners of the team as good friends. In particular, he’s known Gary Stray, the team’s crew chief, since their days working together in the mid 1990s and early 2000s on the now-dormant Union Internationale Motonautique Class 1 offshore racing circuit. James Sheppard and (right) Steve Curtis. Curtis was, of course, referring to the Spirit of Qatar team he led for several years before it abruptly exited the sport in 2015. His highs—setting a 244-mph record during the 2014 Lake of the Ozarks Shootout in the team’s 50-foot turbine-powered Mystic catamaran with Sheikh Hassan bin Jabor Al-Thani—and lows—the epic fail of the Qatar-backed Offshore Powerboat Grand Prix organization—were significant. Throughout it all, Curtis, who’s spent a lifetime is the sport, maintained perspective. That the comeback came in the Miss GEICO cockpit was unexpected, Curtis admitted. “Yeah, sure, it was little strange because Marc and Scotty are good friends of mine,” he said. “But they wanted to have a break and sort some things out for themselves, and I was happy to be able to help. “Now that the season is over, I think they (the Miss GEICO ownership group members) will take a break over the Thanksgiving holiday gather themselves together and work out what they want to do next year,” he added. As for Curtis, he’s up for anything. Now Curtis is, literally and figuratively, on holiday. He won’t be heading back to England this week—he hates the weather there this time of year, plus Thanksgiving is less than a big deal in the United Kingdom. Instead, he’s thinking about taking his kids some place warm and tropical. The offshore racing season is behind him. It’s time for a break. But wherever Curtis ends up, there’s a good chance you’ll see him in raceboat next year.